Last week I went to Del Posto, Mario Batali’s Chelsea outpost, with a friend from California. Despite our table upstairs, which was somewhere between Siberia and no where, we had an enjoyable meal. We ordered a fantastic bottle of Tenuta Friggiali Brunello di Montalcino 1999 ( Sangiovese). For the first course we shared two pastas - spaghetti with crab meat & Garganelli al Ragu Bolognese. 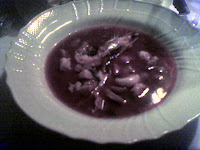 For the “secondi”, I had Cacciucco - Italian fish stew consisting of several different types of fish and shellfish cooked in wine, tomatoes, and chili pepper (photo). It was excellent but a little too much oil for my taste. For the dolci, we had the Budino di cioccolato - chocolate pudding, chocolate streusel and whipped cream. The food was good, but I would not say great. But the service was – there when you needed something, not when you didn’t.